Investigators need to understand what is required to enable their investigations to stand up to scrutiny if it is challenged, particularly if any disciplinary action results from it. In this Investigations Insight edition, Worklogic Senior Investigator, Tom Henry explains the key lessons for employers from some recent Fair Work Commission (FWC) cases relating to an employer’s duty to provide procedural fairness to an employee before dismissing them. Natural justice is at the heart of ensuring a procedurally fairness investigation, and consists of two parts. Firstly, the ‘no bias’ rule requires that the investigator must be free of bias or conflict of interest. Secondly, the ‘hearing’ rule requires that a person responding to allegations must have a full opportunity to respond to those allegations before findings of fact are made in relation to them, and also to have their response considered. In three recent cases in the Fair Work Commission, it has been found that, even if the employer had a valid reason to dismiss an employee for misconduct, they will be found to have unfairly dismissed them, if they have not given the employee a proper opportunity to respond to the allegations first. In the first of these cases, Ross Wunungmurra v East Arnhem Regional Council  FWC 6808, the alleged actions were not contested, however the hearing concerned whether the steps taken prior to dismissal were fair to the employee. Mr Wunungmurra was employed by East Arnhem Regional Council as a community night patrol officer. The Council alleged that on a number of occasions he incorrectly filled in his timesheets (for work he had not done), and eventually terminated his employment on 27 March 2018. On 24 January 2018 Mr Wunungmurra received a ‘final warning’ letter. The letter alluded to previous meetings where his attendance and performance had been discussed with him, and warned ‘if significant improvement in your performance is not achieved by 22 February 2018 your employment may be terminated’. The letter asks him to notify his manager if he is unable to attend work, and to ‘act lawfully and honestly in his dealings with Council when completing his timesheets’. At the meeting in which he received this letter, and was counselled about his actions, Mr Wunungmurra said that he had not had time to arrange a support person. The meeting still proceeded. There were attempts to arrange a formal counselling session with Mr Wunungmurra between late January 2018 and 20 March 2018 but this was not successful. On 27 March 2018 a meeting of community night patrol team was held where attendance and timesheet accuracy was again discussed. Following the meeting, Mr Wunungmurra’s manager, Ms Roper, spoke to him in her office, and listed various recent issues to Mr Wunungmurra in respect to his completion of timesheets. After hearing a response from Mr Wunungmurra, Ms Roper advised him that his explanation was unsatisfactory and that Council had decided to terminate his employment without notice and effective immediately for serious misconduct. Ms Roper then handed Mr Wunungmurra a letter which outlined the specific transgressions with regard his filling out of timesheets. Mr Wunungmurra applied to the Commission for unfair dismissal. Commissioner Bissett found that Mr Wunungmurra had been unfairly dismissed. She said that, firstly, the timesheet transgressions did not amount to a valid reason to dismiss Mr Wunungmurra. However, she also said that even if they were, Mr Wunungmurra was not accorded natural justice. Firstly, the ‘warning letter’ of 28 January did not specifically list the timesheets that were alleged to have been dishonestly filled in. Furthermore, the termination letter given by Ms Roper to Mr Wunungmurra in the meeting of 27 March had been prepared by the CEO prior to that meeting, and therefore it was evident that nothing that Mr Wunungmurra could say in response to the allegations in this meeting would change the fact of his dismissal. “There is no reason the issues identified with [the patrol officer’s] record keeping in the fortnight ending 25 March 2018 could not have been put to him in writing and some explanation sought prior to a decision being taken to terminate his employment. In the following two cases, as the facts were contested, the allegations should have been properly investigated prior to findings made and disciplinary action, but this did not occur. In Kozmanyan v Platinum KS2 Pty Ltd ATF Platinum KS2 Trust  FWC 4326, Ms Hasmik Kozmanyan was employed on a sponsorship agreement on a 457 visa as a restaurant manager. In the months leading up to February 2018 all employees were aware that the employer was encountering financial difficulties, and this was impacting on rostering. Eventually, due to these financial pressures on 27 February, Ms Kozmanyan was given four weeks’ notice of her termination by her employer. On 12 March, however, she was summarily dismissed for breaching the confidentiality clauses of her employment contract, which meant she was not entitled to four weeks’ pay. The employer alleged that she had told the landlord of the restaurant that the employer would close soon and that she had been laid off due to financial difficulties. Ms Kozmanyan brought an action for unfair dismissal in the Fair Work Commission, claiming that she was not at work at the time of the alleged breach of confidentiality, and that she did not speak to anyone about the financial difficulties of the employer. Commissioner Riordan found she had been unfairly dismissed. Firstly, the employer did not conduct any investigation into the alleged breach of confidentiality, nor was Ms Kozmanyan (or her fellow manager) given an opportunity to respond to the allegation. The employer had simply relied on a general statement from the landlord of the premises, to the effect that ‘a female manager’ had told him the information. The employer therefore had no basis for a clear belief as to who had breached confidentiality, but proceeded on this basis to dismiss both female managers. The Commissioner therefore found that not only did the employer not accord natural justice to Ms Kozmanyan but there was insufficient evidence even to have put the initial allegation to her, let alone dismiss her. In Ms Vanessa Rojas v Beacon Products Pty Ltd  FWC 4317, Vanessa Rojas was dismissed for ‘grave misconduct towards colleagues causing conflict and negativity within the workplace.’ She applied for unfair dismissal in the Fair Work Commission. During the hearing, the manager responsible for dismissing her, Mr Warren Skry, said he had undertaken an investigation into numerous claims made by various employees into the behaviour of Ms Rojas over time. He said that he had witnessed many employees upset at the way Ms Rojas was said to have spoken to them, and that some had resigned as a result of this. The alleged treatment mainly centred on Ms Rojas’s manner towards a key employee, Ms Curley, who had become unwell and taken time off work, as a result of which productivity in the office had fallen. Ms Skry said he undertook an informal investigation of the complaints by speaking to staff who had corroborated Ms Rojas’s poor treatment of Ms Rojas’s manager Ms Curley. He said that following this he spoke to Ms Rojas and gave her a verbal warning to improve her behaviour. He said the complaints however continued and he issued Ms Rojas with a formal written warning. From this point other employees reported to him that the alleged bullying against Ms Curley had not stopped and that she was on the verge of resigning. Given Ms Curley’s importance in the company, and after further discussion with current and past staff, he said he formed the view that Ms Rojas’s rude and dismissive manner towards Ms Curley was unacceptable and she had systematically bullied her co-workers over a long period. Mr Skry told the Commission that he believed at this point his duty of care towards his other staff required him to dismiss Ms Rojas in order to protect them from any further inappropriate actions from her. Ms Rojas’s evidence before the Commission contradicted that of Mr Skry. She claimed that conflict in the office centred on the acrimony between a Ms Comerford and Ms Curley, and that Ms Rojas and other employees were ‘caught up’ in this atmosphere. She said that Ms Curley was paranoid about her on the basis that she assumed Ms Rojas had taken Ms Comerford’s side. She put forward witnesses who stated that Ms Rojas had been a pleasant and agreeable employee. She also disagreed that she had been given multiple warnings by her employer to improve her behaviour. Commissioner Williams found that there was little objectivity in the evidence of the witnesses put forward by Ms Skry or by Ms Rojas; essentially, it all depended on ‘whose camp’ they were in. The Commissioner found that the office was ‘a dysfunctional, shambolic environment’, split into divided loyalties along strong personalities in which allegiances changed from time to time. In this context, the Commissioner Williams found that Ms Rojas was not accorded natural justice, in that she had not been provided with an opportunity to respond to the allegations, or any specific examples of the alleged behaviour, including who the alleged behaviour concerned, or who had raised the concerns. For this reason the dismissal was unfair. Provide all allegations to the employee in writing (best practice is to allow at least two days for the employee to prepare a response). Ensure the allegations are specific and not vague. All allegations must be sufficiently clear and specific to be capable of being fairly responded to. This means specific examples of the inappropriate conduct, including dates and times, places, people involved and what the alleged inappropriate action was. In addition to the allegations, make it clear (in writing) what policies are alleged to have been breached if the allegations are proven, and that this may result in disciplinary action, up to and including termination of employment. Give the employee an opportunity to respond to the allegations in an interview or meeting. Explain that they may bring a support person with them. Consider the response of the employee before making findings or deciding on disciplinary action. Don’t jump to conclusions beforehand. 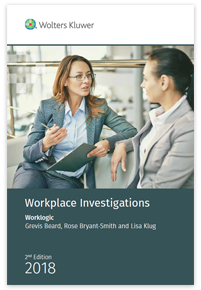 If you would like to learn more about how to conduct a fair and effective workplace investigation, you should read Worklogic’s ‘Workplace Investigations‘ book, recently published by Wolters Kluwer. Workplace Investigations is the definitive guide to conducting effective workplace investigations for Australian HR professionals. Workplace Investigations shows you, step-by-step, how to conduct a sound, procedurally fair and defensible workplace investigation.